Scams are all over the internet, but certainly they are more common in the gambling industry. You can also expect each vendor to claim their products are best. The truth is hidden beneath a mountain of nonsense, and you will not know the truth without doing thorough research on the most important and relevant points. This page will help you determine the truth for yourself. * Multiple favorable video segments cut and joined: a seller may only show the impressive parts of their video. * Video relatively short: the vendor may conveniently claim the videos are short because of youtube’s 15 minute limit. They need only use one of many other video hosting service that doesn’t have limits, or host the video in their own hosting accounts as I do for longer videos. * Generating charts of raw/untuned predictions, picking the best peak, then claiming its proof of the computer’s effectiveness: This is no different to throwing a ball, waiting for it to land, then saying you knew it would land there. * Predicting which diamond will be hit at the end of spins instead of immediately after the prediction: you will find my diamond targeting video demo announces the predicted diamond immediately after prediction. Another vendor has his computer predict the diamond after the diamond is already hit. He is not exactly inputting the hit diamond, but what he does is continue clocking the ball to near the end of the spin so the computer can better predict which diamond will be hit. Additionally, the offset (tuning distance) is much the same for both of the dominant diamonds. This means that no matter which of the two diamonds are hit, the ball will still usually travel the same distance. Combined, this is extremely misleading and gives the illusion of diamond hit prediction accuracy. * Ball bounce / scatter: if the ball tends to solidly hit a diamond and bounces a predictable distance, such a wheel is extremely easy to beat. On these kind of wheels, you can easily achieve the same accuracy without any electronic device. * Dominant diamonds: a wheel with either 1 or 2 dominant diamonds is much easier to beat, especially when they are right next to each other. In my public demonstration (see videos), the wheel had 3 dominant diamonds that were evenly spread around the wheel, and the ball bounces in much the same way as modern casino wheels, because we used the latest John Huxley roulette wheel. * Rapid ball deceleration: The more rapidly the ball decelerates, the easier it is to predict. This is because there is a greater difference in speeds between each revolution, so it is much easier for the computer to determine one revolution from another. On a typical used roulette wheel that is easily beaten, the difference between one revolution and another is about 250ms at the time of prediction. On a new wheel like the one in my public demo, the difference between ball revolution timings at the point of prediction was 90ms. This is more than twice as difficult as wheels used by other roulette computer vendors. * Teflon ball: Teflon balls are plain white and tend not to bounce much at all. My latest demo videos, including the public demonstration video, use an ivorine ball which is far bouncier and more difficult to predict. If the vendor uses a teflon ball, they have opted to demonstrate with much easier conditions. Time of predictions: If the prediction is very late in the spin, you may have high accuracy, but in a real casino, no more bets will be called before you can bet. In ideal conditions, you usually have predictions no less than 7 seconds before the ball falls. In my public demo video, where there is no room for multiple attempts, my predictions are obtained approximately 13 seconds before the ball falls. This is approximately twice as early. In every video demo from other vendors, I suggest you learn basic visual ballistic methods and computer algorithms and use them on the footage. 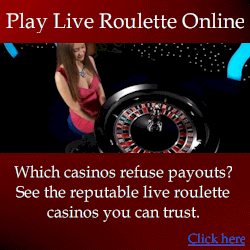 Then you will see for yourself how easy it is to achieve the same level of accuracy, without using a roulette computer. In attempt to compete, some vendors have created numerous fake review sites where they rate competing devices poorly, and rate their own as best. I have my own review site at roulettesystemreviews.com although as you can find for yourself, the reviews are honest and accurate. Reviews from dishonest vendors are on various websites using fake names so they appear to be neutral and independent. Both Miro Zirdum and Mark Howe have multiple review sites full of biased and distorted nonsense. Additionally, in particularly Mark Howe is renowned for spamming countless forums and message boards to attack his competitors under fake names. You need to do thorough research to understand what they do to complete. If you want to know who is lying and who is telling the truth, ask the right questions. If you persist and a seller has something to hide, they’ll give an excuse to refuse to answer, or will outright lie. Often they will present irrelevant information to divert topics. Understand a scammer will say whatever they must to get a sale. Expect liars to continue to lie. You are going to need to dig for the truth, and I suggest focus on what is relevant unless you are concerned with irrelevant, distorted and petty nonsense.